Touch the dual colored marble, sourced from two different quarries due to a forty year pause in construction. Stare up 90 degrees at the Egyptian-style obelisk. Admire its extensive history. Visitors are permitted inside, but free tickets must be obtained the day-of, and they’re usually all distributed by 9am. Head south (to the left at this angle) of the Washington Monument, veering off the National Mall, until reaching the Tidal Basin; follow along its eastern side and cross a bridge. Continue along the Tidal Basin’s edge to reach the Jefferson Memorial. 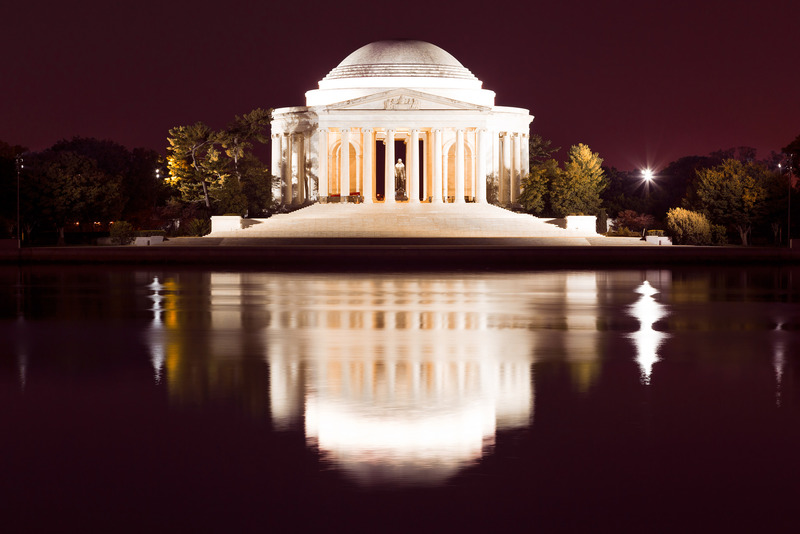 The marble, neoclassical structure alights the Tidal Basin at night. The memorial was ranked fourth on the “List of America’s Favorite Architecture” – the grandiose design is an adequate tribute to America’s favorite Founding Father. Continue along the scenic Tidal Basin to reach FDR’s memorial. The monument is intertwined within nature – a testament to a president who greatly revered the outdoors, despite his handicaps. His famed quotes are scratched into natural rock formations, and four outdoor rooms symbolize each one of his presidential terms (being the only president who served more than two; in 1947, the 22nd Amendment limiting Presidential terms was ratified by the states.). The memorial also incorporates man-made waterfalls, symbolizing his sponsored dam-building projects. Continue to follow the Tidal Basin until arriving at the feet of one colossal tribute. 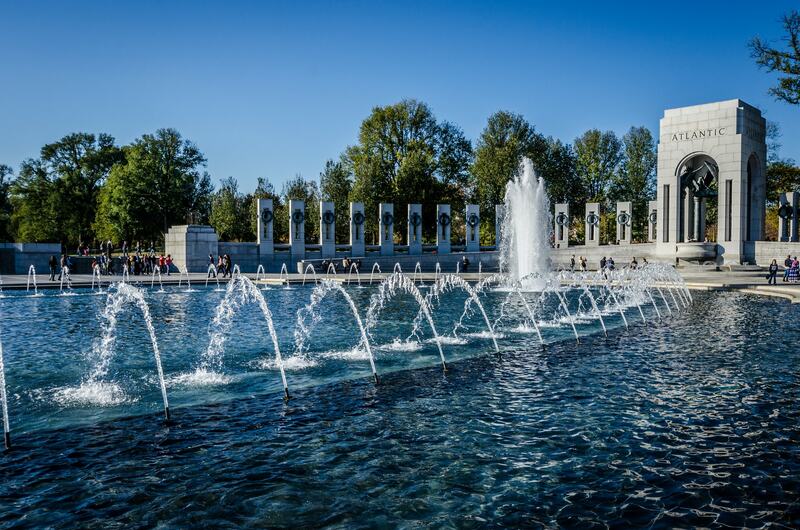 You’ll find yourself at a fountain commemorating the loss of U.S. soldiers during WWII. Consisting of 56 pillars, each state has its own column, along with the U.S. territories. 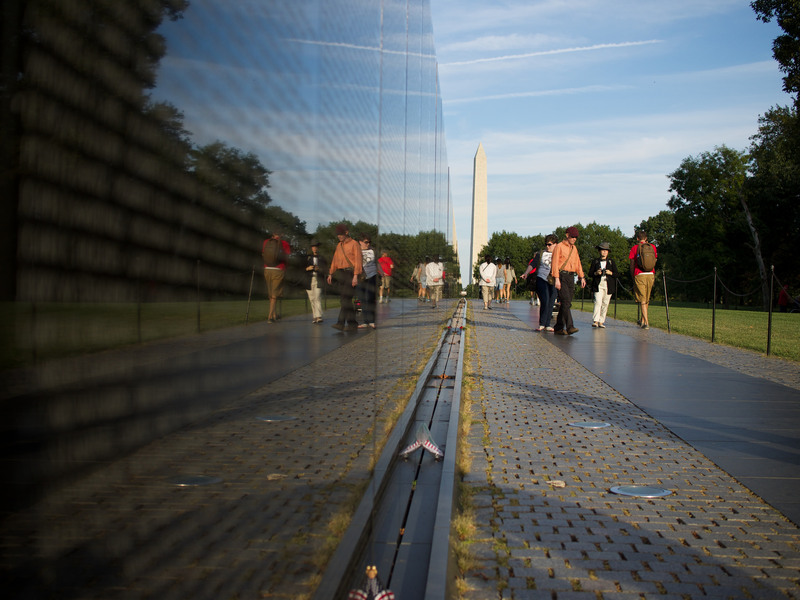 Approximately 4.4 million people visit the memorial each year. 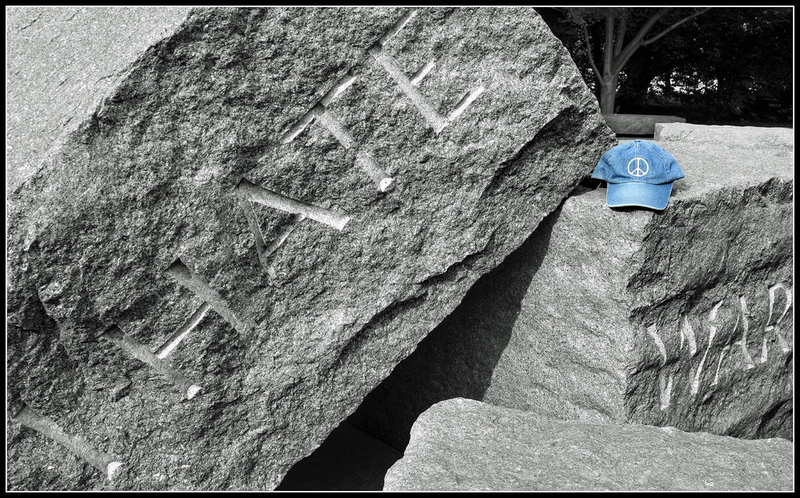 It sits at the base of the reflecting pool that leads to The Lincoln Memorial. 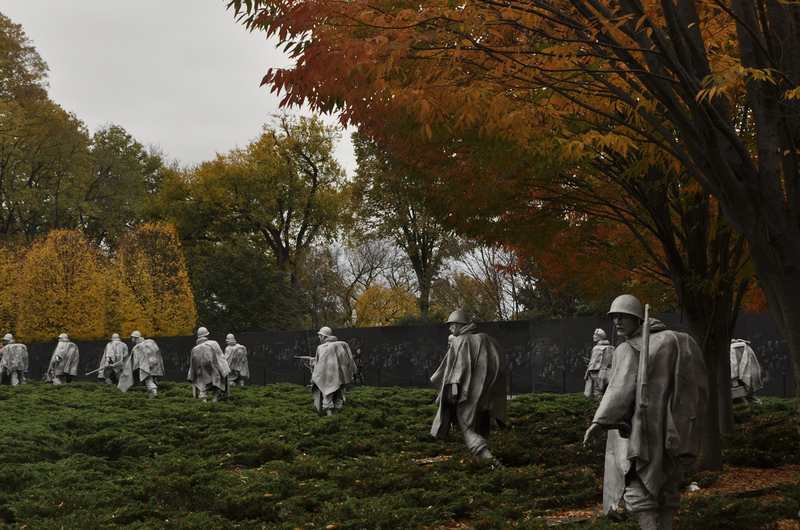 Walk parallel to the reflecting pool to reach the Korean War Veterans Memorial. Nineteen stainless steel statues, adorned in full combat attire and each measuring seven feet tall, surround a remembrance wall. Drawn directly into a 164 feet long black-granite wall, images of the war and its heroes are embedded. Head north to reach the nation’s most iconic president, staring solemnly over the National Mall. He sits on a throne enclosed in a Greek-style temple, with design features reminiscent of the Parthenon. MLK’s “March on Washington” finished at these marble steps – fitting for a memorial of the man that issued The Emancipation Proclamation. Continue north for the final stop on a monument walking tour. This is the home of the famed Vietnam Wall – 58,307 names of Americans who died in Vietnam are etched into the gabbro rock. When facing the wall in sunlight, the visitor’s reflection is projected onto the wall – allowing people to physically see themselves with the dead, and to merge past and present. A living wall to commemorate those who never left ‘Nam.